Yeastie Boys are a brewing duo (without their own brewery) that has been amongst the leading innovators during the recent rise of craft brewing in New Zealand. The brainchild of Stu McKinlay and Sam Possenniskie – two of New Zealand’s most prominent beer activists – Yeastie Boys has spent the last seven years picking up trophies, receiving critical acclaim from around the world, and proving to even the most cynical beer geek that contract brewing can result in great beer. In 2016 Stu relocated to the Kent countryside from where he oversees their UK production, exporting to many countries worldwide. 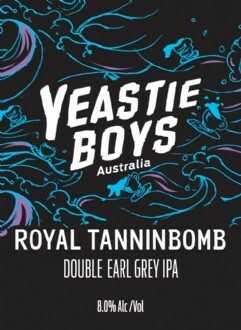 Yeastie Boys’ Gunnamatta Earl Grey IPA was the champion beer at the first Great Australasian Beer Spectacular in 2012 and has since scooped a gold medal in the World Beer Awards. Royal Tanninbomb takes the base recipe and dials everything up significantly, resulting in an 8% beer. A well-constructed combination of Kiwi hops brings lime and a zesty earthiness to the beer. Blue Flower Earl Grey tea (Not Included) adds the distinct flavour of bergamot, which complements the hops brilliantly. Note: Tea is not included in the ingredients supplied, you will require 120g of Earl Grey Blue Flower Tea. Also this recipe requires 200g of Invert Sugar which is also not included in the kit.